The CD3 is a hand-held device developed by the FDA to detect counterfeit drugs and packaging. The Food and Drug Administration has a new cutting-edge tool in its counterfeit drug detection toolbox. At a symposium Monday, the agency unveiled the Counterfeit Detection Device #3 or CD3, a hand-held device developed by FDA scientists that can be used in the field to detect counterfeit products and packaging. "This device was designed in-house by FDA scientists in response to the needs for screening in the field," said FDA Commissioner Dr. Margaret Hamburg. "It is low cost compared to other analytical devices, operates with batteries, and requires minimal training to use. It allows for 'real time' comparisons with authentic drugs - and has already proven useful for identifying counterfeit drugs at our busy international mail facilities." CD3 is currently being used in 50 FDA field laboratories, as well as border crossings and import centers. It's also used in a number of international mail facilities including those in San Francisco, Los Angeles and Chicago and other points of entry, where inspectors screen drug ingredients, finished products and dietary supplements to identify counterfeit, falsified and unapproved drugs, cosmetics, foods, medical devices and cigarettes. The battery-operated LED machine emits 10 different wavelengths of light like ultraviolet and infrared imaging and can be used on tablets and capsules, powders, and packaging (inks, papers and covert markings). It can also detect products that have been tampered with, re-labeled or re-glued. The CD3 has been used to analyze nearly 100 counterfeit products including drugs like Crestor, Lipitor, Oxycontin, Viagra, Tamiflu, Singulair, Plavix and Wellbutrin. According to Hamburg, the amount of FDA regulated products imported into the United States has quadrupled from 6 million to 24 million. Eighty percent of the facilities manufacturing active ingredients for FDA-approved drugs are outside the United States. In addition, 30% of the drugs on U.S. shelves and 30% of all medical devices come from overseas, she said. "In total, some 300,000 foreign facilities spread across 150 countries are sending FDA-regulated products to our shores. And, these products now account for approximately 11% of all U.S. imports," Hamburg said. In fact, Hamburg says the FDA has ranked - in order of risk of adulteration - more than 1,000 active drug ingredients. "Given the scope of the problem - and the potential threat to public health - the FDA has made counterfeit and adulterated drugs a top priority," Hamburg said. "American consumers have every right to expect that the medicines they rely on are exactly what the package and label say they are - medicines that have been carefully evaluated by FDA for safety, efficacy, quality and purity." CD3 costs $1,000. Results are preliminary, and the findings still need to be confirmed by laboratory analysis, but FDA scientists say they are already working on the next generation counterfeit device. 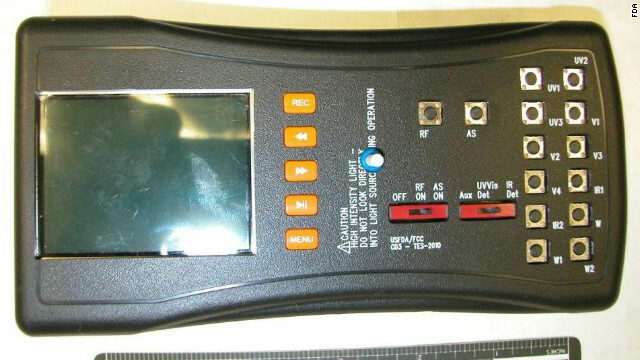 Hey guys check this nifty gadget to detect counterfeit products.